Andrew and Todd were brothers. Andrew was twenty years old and Todd was 18 and had just finished high school. Andrew had decided not to go to college but to stay home and help his dad with the family business. The business was growing rapidly and Andrew enjoyed learning all about it. Todd was just as ambitious as his brother. He had plans to go to college and study law. He had been accepted into a prestigious university in a neighboring town. He would live at home and commute to class. As a college student Todd applied himself well to his studies but he was getting tired of the long hours studying plus he had a part-time job so he could pay his gas and have some spending money. One day, his professor asked him to stay after class. He told Todd about an opportunity to go live overseas, study abroad and take his career to a new level, once he finished his studies. Wow! That night Todd’s mind was racing and he couldn’t sleep. The only problem was that the program required a huge sum of money to be paid up front. This would cover his air fare and first year’s tuition, plus some “miscellaneous fees.” Where would he get that kind of money? Even though he was nervous, he decided to ask his dad for the money. His dad said that even though business was good and things were growing, he just didn’t have the money to give him. Besides, wasn’t this kind of risky? But Todd persisted and knew his dad had money put back for Andrew’s and his inheritance. So he asked for his half of the inheritance money! This would be enough for Todd to pay for the program and have spending money for quite a while. A few days passed, and just in the nick of time, his dad agreed to give him the cash. Once he arrived in the new country, things were very different! But he found his way to the University, got settled into his on-campus apartment, and was eager to begin classes. Everything went well for the first few weeks. The only problem was that he was lonely being half-way around the world from his friends and family. Once day he met some other students and started hanging out with them. They were all in the same program. Some of them were from there and others were foreigners like Todd. The group studied together and partied together, too. But things were still pretty good. Todd’s grades were good and he wasn’t lonely anymore, especially once he and one of the girls from the group began dating. Almost a year had passed. Things were not going so well for Todd. He and his friends got into partying and social life more than studying and attending classes. One day the dean called Todd to his office to tell him he was being cut from the program. Without being enrolled in the University Todd could no longer live on campus and would have to find housing elsewhere or go home. But he could not go home. How would he ever face his father? So he decided to go to work for one of the citizens in exchange for a place to live. This new arrangement was not the kind of lifestyle Todd was used to. He had little to nothing to eat and his friends were gone. Now he really felt like a foreigner. Now he couldn’t sleep at night because he couldn’t stop thinking about home. At home he had everything he needed. At this point, Todd has just enough money left to buy a plane ticket back home. Todd’s dad looked down the road from his home one day and saw Todd walking toward the house! His eyes filled with tears and his heart swelled with joy to see Todd, his long lost son. They hadn’t even talked in a very long time. Todd’s dad ran to meet him and hugged him as they made their way to the house. Todd was so ashamed to tell his dad what all had happened. He even told him that he would get a job and pay to live in the house with his family, if they would allow it. But dad was so glad to have Todd home that he told his wife to cook a big meal, complete with dessert. You would have thought it was Thanksgiving or Christmas by the looks of all the food! When Andrew came home from running errands for his dad, there was music playing and all the family was gathered around for the feast to welcome Todd home! Andrew was more than just a little upset. Here he had stayed home, loyal to his father, heaping with family business while Todd had gone and squandered his inheritance and had brought shame to the family name by getting kicked out of school. The dad took Andrew aside and told him, you will always have me and all I have will be yours. But your brother was as good as lost to us but now he is found! Of course this is a totally made-up story. There is another story about a prodigal that is very similar. You can read it in Luke 15:11-32. But what is the point of these stories? The point is that each of us has played the prodigal. But there is hope, just as there was hope for Todd. 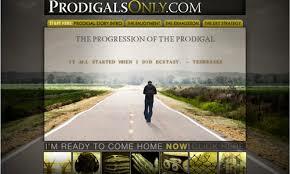 Are you still a prodigal? Visit http://www.prodigalsonly.com and find hope today!